Overview The menopause means the final menstrual period – diagnosed retrospectively after one year of amenorrhoea. Cessation occurs due to loss of ovarian function. The “declining oocyte pool” theory states that a newborn girl is born with millions of eggs, most of which die by atresia. The average age of menopause is 50, however this can vary widely between different cultures. Premenipause: or menopause transition, begins several years before menopause. Climactric: Phase encompassing the transition from the reproductive state to the non-reproductive state. The term peri-menopause is synonymous with the climacteric. This is a phase of menstrual cycle irregularity, fluctuating hormone levels and symptoms associated with ovarian senescence. Lasts an average of 4 – 6 years before the final menstrual period to 1 year after the menopause. Menopause is a normal physiological process! Due to the risks involved with HRT, many women may prefer the perceived safety of complementary and alternative medicines in the management of menopausal symptoms. Transvaginal ultrasound: will show small ovaries with minimal follicular activity in POF. Can help distinguish between other causes (e.g. 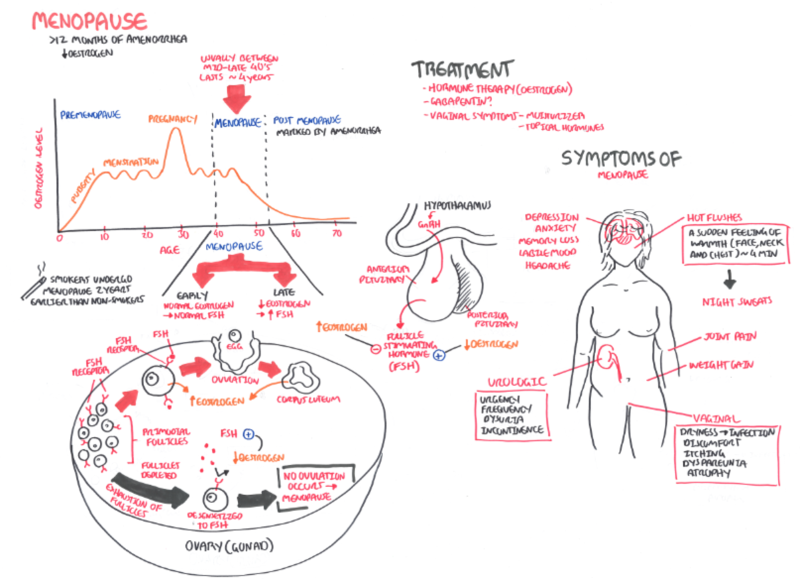 PCOS, Asherman’s syndrome). Macgowan, BA., Owen, P., & Thomson, A. (2014). Clinical Obstetrics & Gyaenacology. 3rd ed. Saunders Elsevier. London.